I've done some woodworking--small projects, all--but, I've never done what I would call "construction". 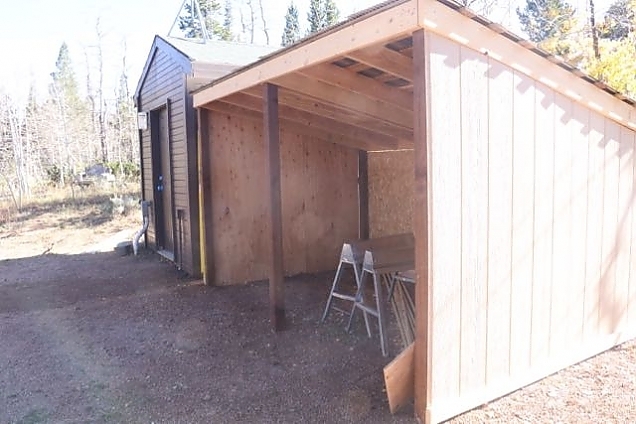 So, as with many other projects I have to get done up here, I embarked on something I don't really know how to do, relying on advice from friends, Google searches and YouTube videos: a wood shed. First, I picked a location. 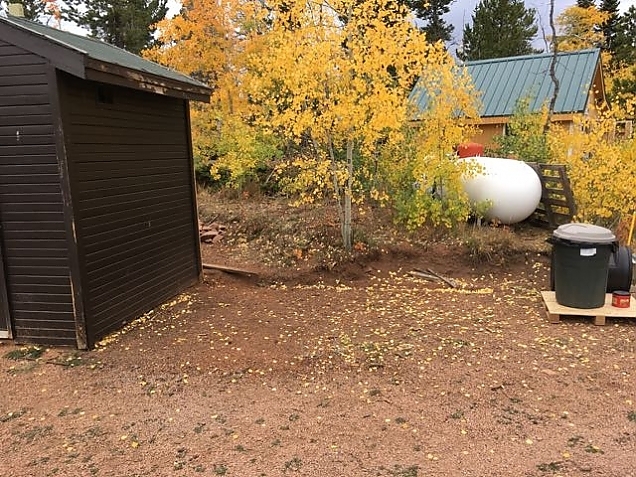 Right next to our existing shed that holds the freezer, second refrigerator, and winter food supplies. We keep bird food in there too, along with other things we want access to with a short walk from the cabin door. Shed location. This is looking south. It will be (approximately) 7 feet deep, 12 feet wide, and built as a lean-to that is 7 feet high in front and 5 feet high in back. Of course, all good construction projects start with a detailed set of plans, drawn up with the help of a neighbor. One reason to be thankful for dirt roads, I guess. The answer came from a neighbor who offered to loan me his trenching machine. A borrowed trencher and "test" trench. 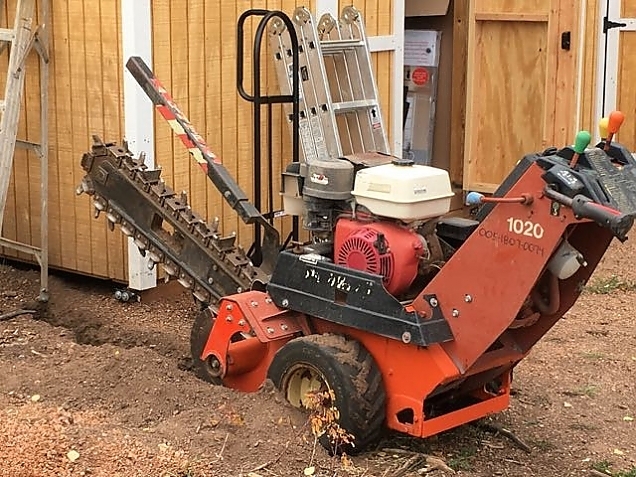 An astute observer will note that a trencher is for digging trenches, not post holes. But, I could dig a short trench with the deepest part right where I want the post! This trencher could go 24" deep and that is what I was able to do with the first couple of holes. 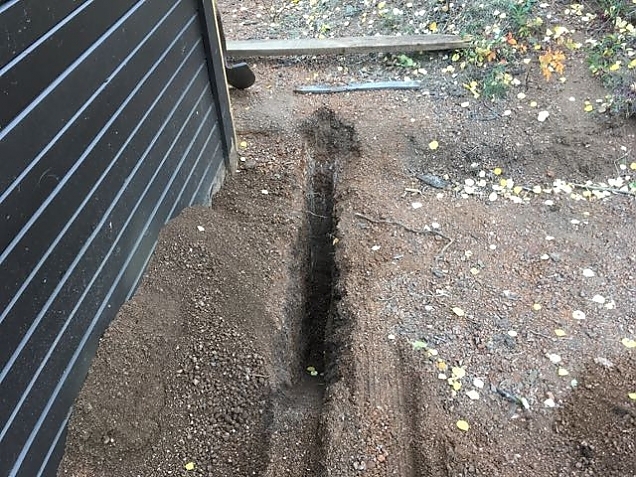 I'd simply dig the trench, set the post, check it for location and level, fill the trench in while blocking the space right next to the post with some 2x4s, and then put some Quickcrete in the remaining hole next to the post! Voilá. A post hole dug with a trencher. I could not get as close to the shed as I had originally planned, but this solution was too elegant to care. I just slid the wood shed location over a few inches. It was a lot of work to get a trench deep enough where the ground was more rocky. I had to settle with 17" or 18" holes on the far west side. But, I think that will be fine given we set the posts in concrete. Destin, of course, is a big help. 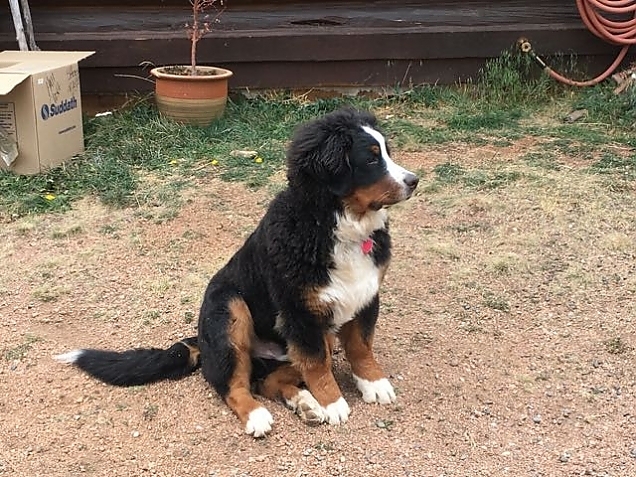 Especially with his love for fresh piles of dirt. 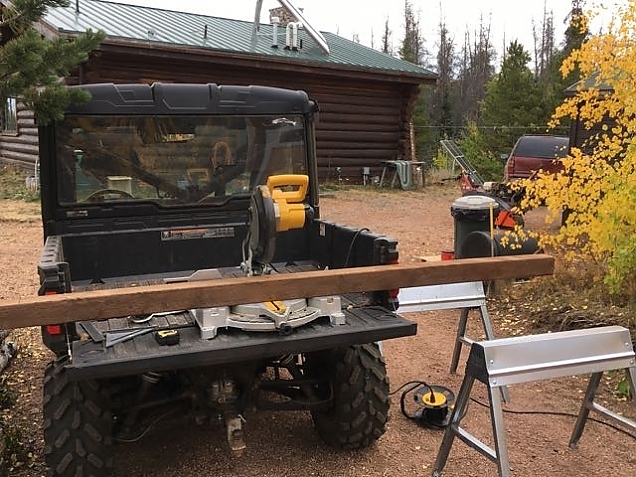 The bed of the Ranger makes a great work platform. To make these cuts and get the tops of the posts all level, I climbed on a ladder with the chain saw and made horizontal cuts. This is something my mother told me never to do. Chainsaws on ladders are a "no no"! Lynne gave me an earful when she came outside and saw what I was doing. Anyway, it worked and I'm still with all my arms and legs. 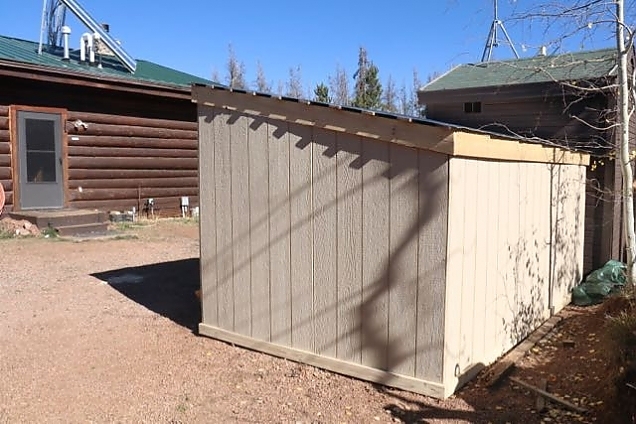 If you want to know how this wood shed turns out, you'll just have to click through for "More...". 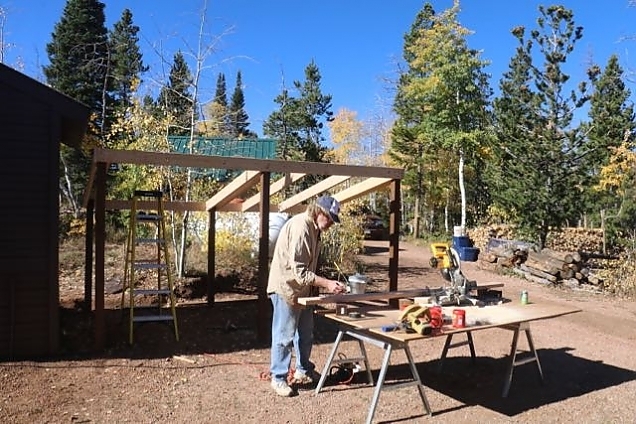 The next step, after getting the posts set and cut level, is to put up a header in the front and back and then start mounting rafters. 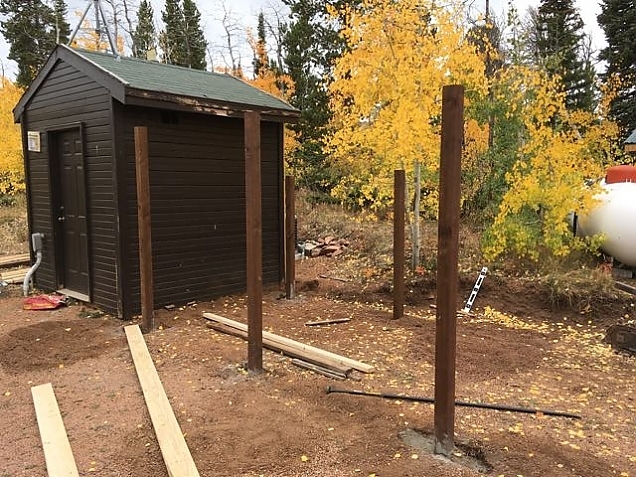 I got some great advice from a neighbor about placing the headers (and thus rafters) on top of the posts for better weight support. The shed needs to be able to support a pretty hefty snow load. And, he gave me some hangers that might allow me to do that. In the end, I did some additional web work, did a few calculations of my own (I used to be an engineer, after all), and modified the plan somewhat so that I could stick to my original design, but still be certain of supporting the snow load. The alternate plan was getting too complicated and required tools and materials I did not have. I hope I don't regret not taking his advice. 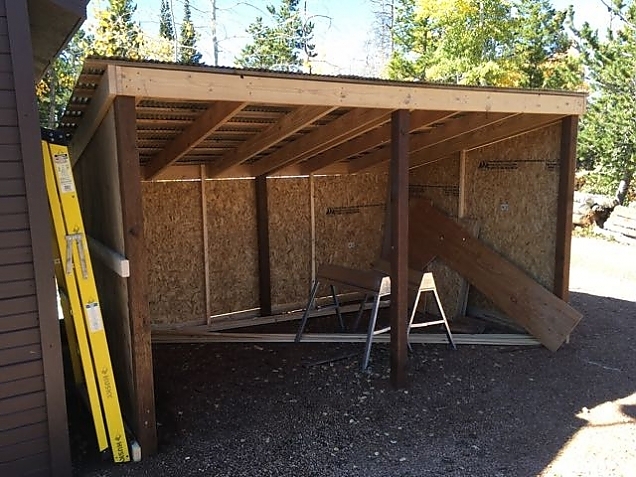 I got the headers and one side rafter in place before the weather turned and we had rain, hail, high winds, and overnight, snow. 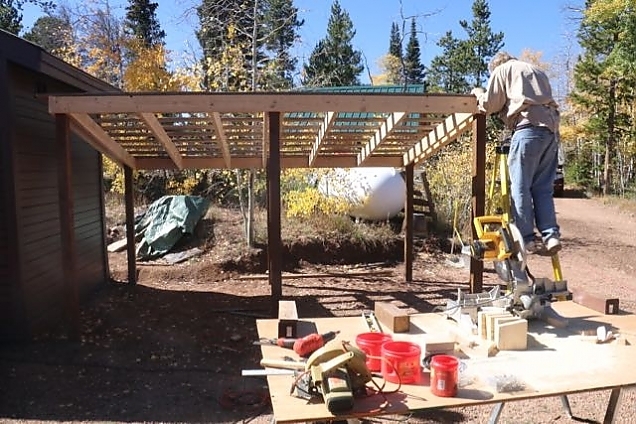 Here I am adding rafters. 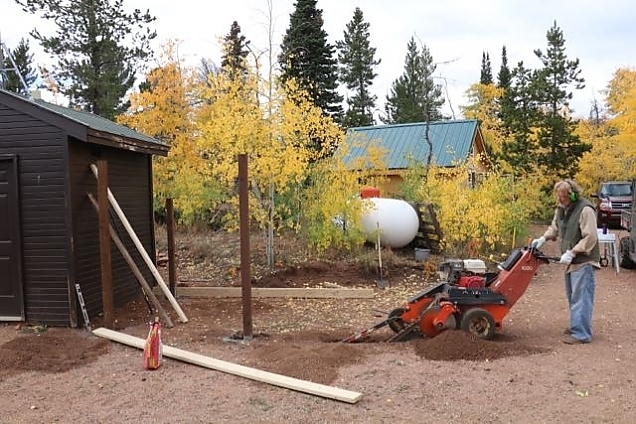 A couple of days later, we shopped for the remaining materials needed and then set aside an entire day to finish the wood shed. We started at about 9:00 in the morning and wrapped up around 4:30 in the afternoon. We added the rafters, then cross pieces to mount the metal roof to, then the metal roof, then siding. About ready for the metal roof. Metal roof from back of the shed. At some point, I'd like to put a green metal roof on the wood shed. One that matches the cabin roof and the barn roof. 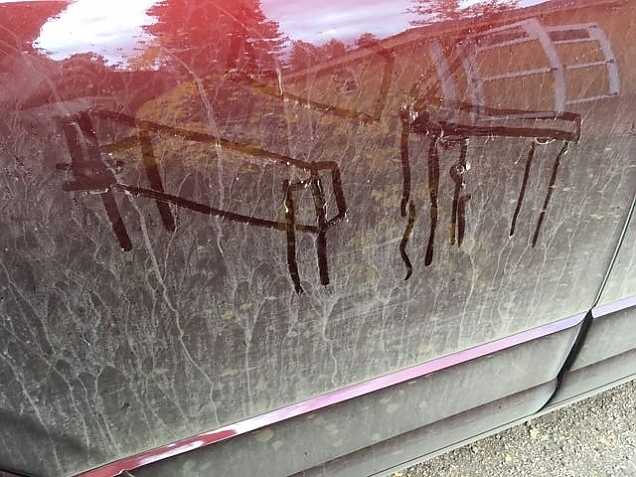 I'd put it on the shed, too. But, that is a custom-ordered item and more expensive, so for this winter I just went with some stock corrugated Strongbarn metal. This is where we get to know how "out of square" the shed is. 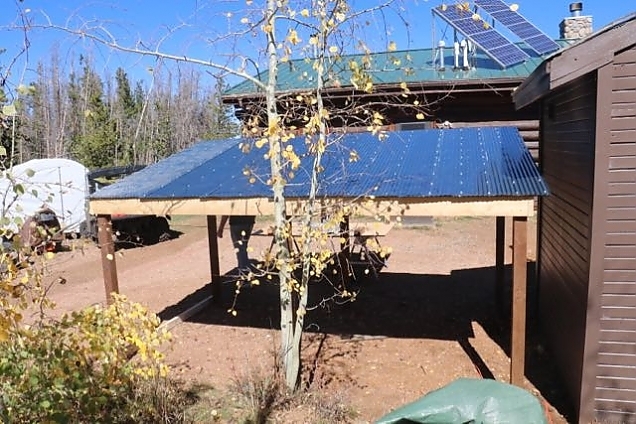 When I started adding the metal roofing, I could align it so that it was square and each piece fit nicely with the next, but when I did the ridges in the metal did not align with the rafters and it looked a bit wonky. So, I had to stagger each piece of metal so that they now need to be trimmed on the edges to make them one nice edge. The result will look fine. Notice also how I managed to get the metal roof on in a way that the shed will drain onto it rather than the gap between the two sheds? We added some support for the siding and installed that next. I think I'll add a couple more vertical 2x2s to further secure the siding to make sure it does not blow or vibrate in high winds. But, we are pretty much done with the basic structure and the next few photos show what it looks like. There is still a little work to be done. I want to add some trim (to cover up the gaps and non-square seams), then it needs to be stained and painted. But, all that is work on the exterior, so we are ready to start loading it up with wood! Here is a 5 minute timelapse movie of the entire day's work. Sorry that the camera was pointed at the sun toward the end.